Peektab is a tablet monitoring app that lets you see what your child does on your iPad. The Peektab app is installed on the iPad that you want to monitor and silently records activities such as web browsing, social media, GPS location, iMessages, photos, app usage, calendar, notes and more. 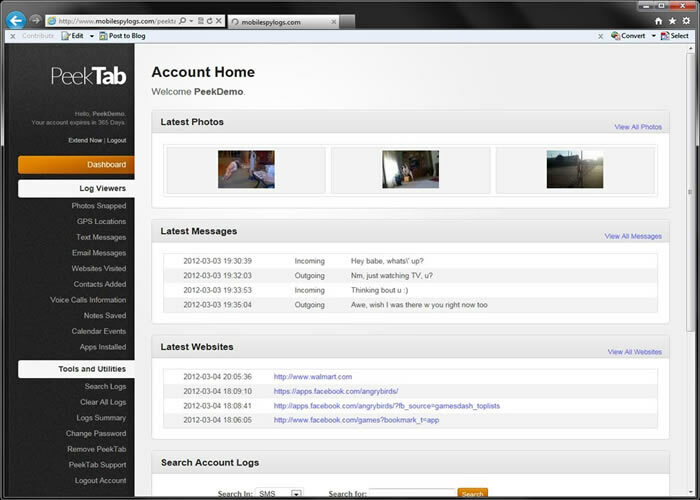 The recorded data is sent via the internet to your Peektab account. You can access it at any time on any device using a web browser. Why You Should Use PeekTab? 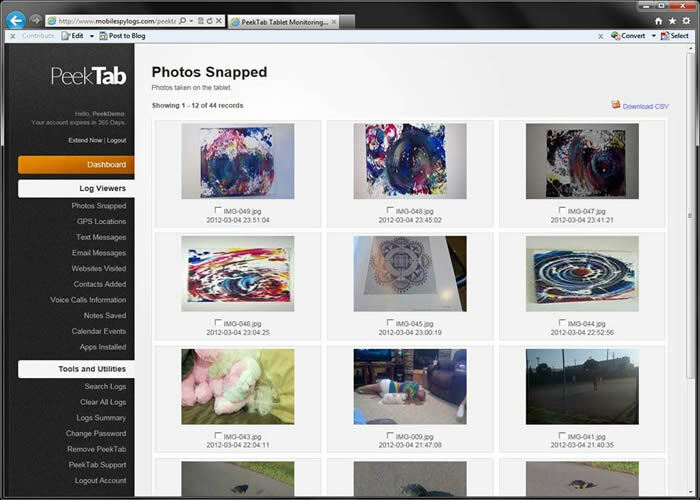 PeekTab offers a robust monitoring service at an affordable price and with a simple user interface. 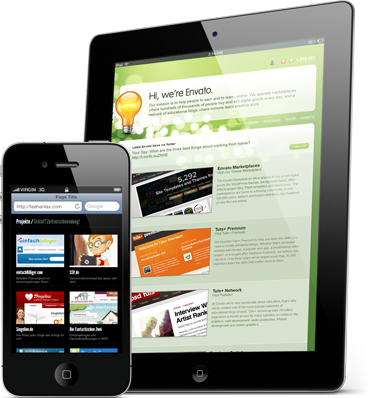 Our team of software experts are here to help you at every step of the way. PeekTab has all the features you need to keep your child's iPad usage in check. Just install the app on the iPad you want to monitor. Installation is quick and easy, and it only takes a few minutes. PeekTab runs in stealth mode, the monitored iPad user will never know about the spy app. If you’re not satisfied with PeekTab for ANY reason, contact us within 14 days and get a full refund, no questions asked. 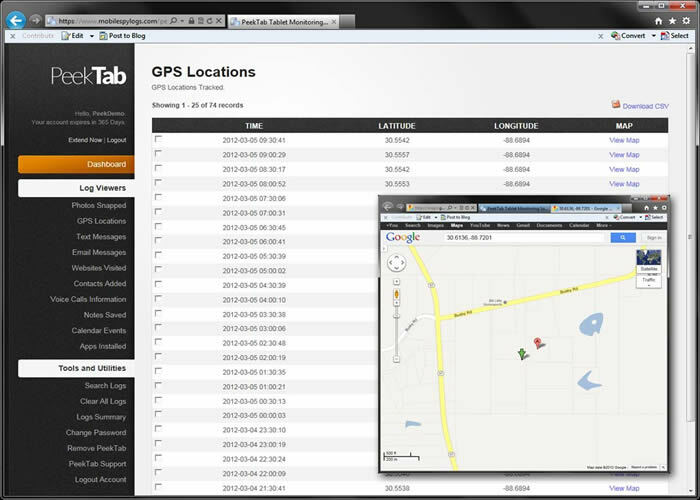 GPS Tracking: PeekTab allows you to track someone’s location in real time, so you will know where they are and where they're going. 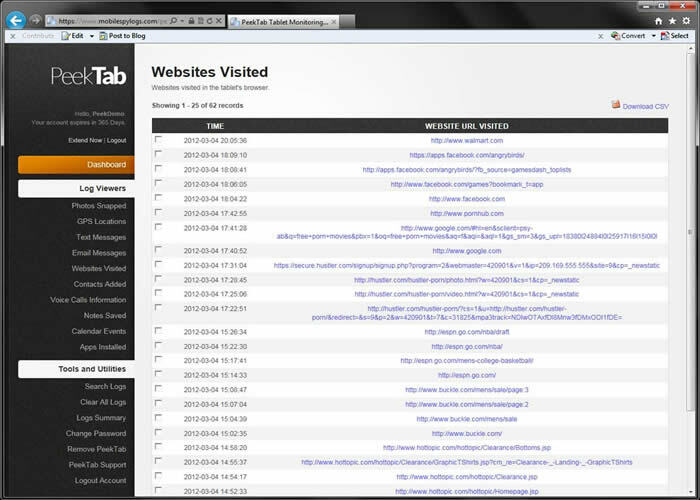 Monitor Browsing History: You can keep tabs on what websites they visit. The spy app records all website URLs visited and sends the data to your account. View Photos: Access all the photos saved on their iPad. View iMessages: Read all sent and received iMessages on their iPad with date, time and contact details. View Installed Apps: See what apps they have installed. 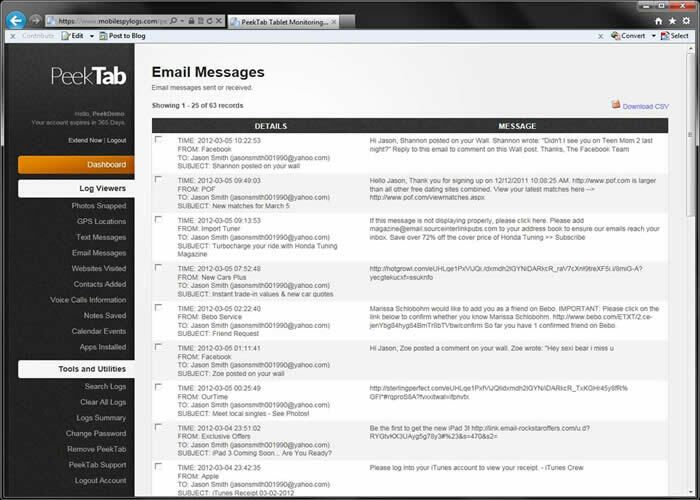 Email Tracking: PeekTab allows you to view all emails that are sent or received through the iPad. Get email address details of all senders and recipients. If you’re looking for an iPad tracking app that’s packed with features and comes at a great price, you need PeekTab. The app is also very easy to install and configure. PeekTab allows a person to see everything that happens on an iPad. It records all activity on the device. That includes messages, photos, and every website visited by the iPad user — then sends the data to the online control panel. Here's a rundown of how to get started with PeekTab. Purchase a subscription on our website. Choose your plan (3-month license for $29.97, 6-month license for $49.97, or 12-month license for $69.97), and pay online using a credit card. Once you purchase, you will be able to download the PeekTab app for iPad. Now install it on the target iPad using the provided instructions. After installing the app, you can monitor the iPad from anywhere in the world — as long as you have an internet connection on your phone, tablet, or computer. 1. To install PeekTab, you will need physical access to the iPad you wish to monitor. 2. The iPad must be jailbroken for the monitoring app to work. 3. The app requires an internet connection to work. Learn how phone spy software works. 4. Once you cancel your subscription, your PeekTab account will be disabled. Why Use a Spy Software? Apple's iPad is the most popular tablet in the world, and PeekTab is on the forefront by introducing the first of its kind tablet spy software for iPad. With PeekTab, you can monitor your child or employee's iPad activities in real time from any internet-connected device, no matter where you are. With a robust set of features and easy-to-navigate control panel, PeekTab is a great tool for parents and employers. PeekTab helps parents monitor iPad to protect their children, and helps employers to protect their companies. Parents: If you want to remotely monitor your child's iPad and internet activity, Peek Tab is for you. You can view their messages, photos and web browsing history, see what apps they use, and monitor Facebook activity. PeekTab also uses the iPad’s built-in GPS to track its location on a map. Employers: Want to monitor your employee's iPad? Get iPad monitoring software now and start finding out the truth about how your employees use their company-issued iPads. You will be able to view employees' iPad internet and email history, see what contacts they have stored, and view all photos on the iPad you are monitoring. The GPS tracking feature lets you know where your employees are at any given time. PeekTab is now available for download. Buy Now! © www.peektabipadspy.com 2019. All rights reserved.